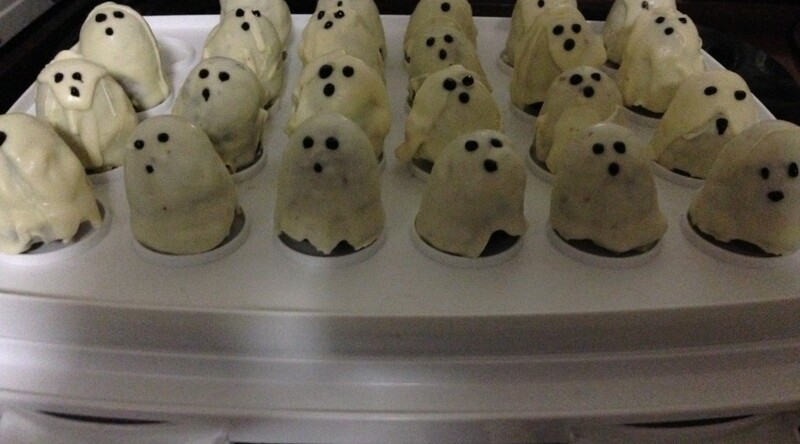 These are the treat boxes my children made for their classmates. 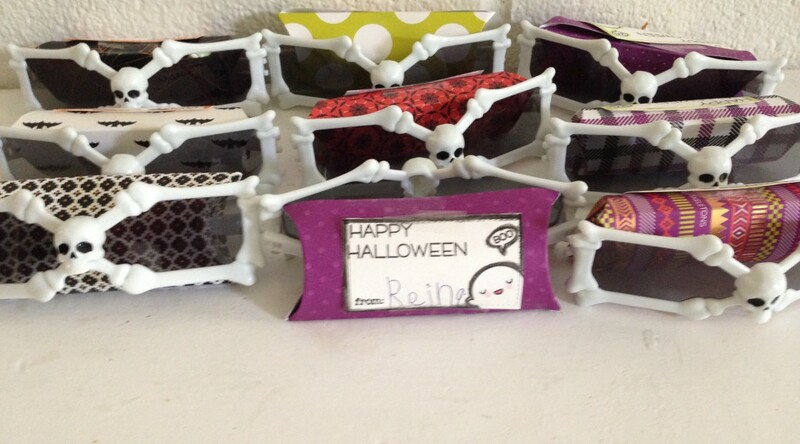 Each box had a Halloween tempory tattoo, the skeleton sunglasses, and a very small piece of candy in it. Size: Pillow boxes made from 6 x 6 patterned paper. Extra Details: I die cut the stitched rectangles from white cardstock. I stamped the sentiments and images on each rectangle. Using water color pencils I add some color to the edges of each rectangle. Once dry, the children signed their names. I cut some 12 x 12 patterned paper into 6 x 6 squares. 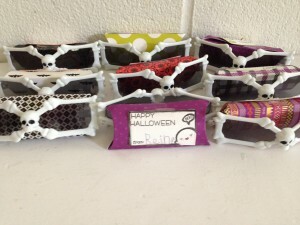 I used the We R Memory Keepers pillow box punch board to create the pillow boxes. I stuffed all the goodies inside and attached the rectangles to the outside. The glasses wouldn’t fit, so I just tucked the arms into the boxes. 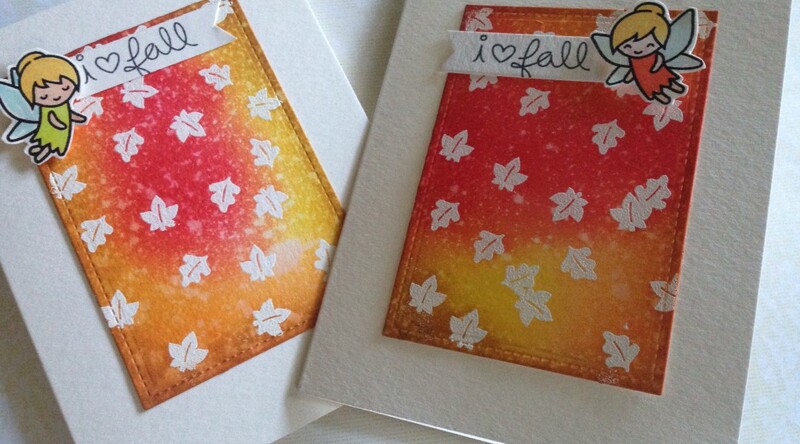 I made two cards today using the same technique. Using my acrylic block that has grid lines and my grid mat, I was able to create a pattern. I covered an entire card for one card and only created a few rows of images for the second card. 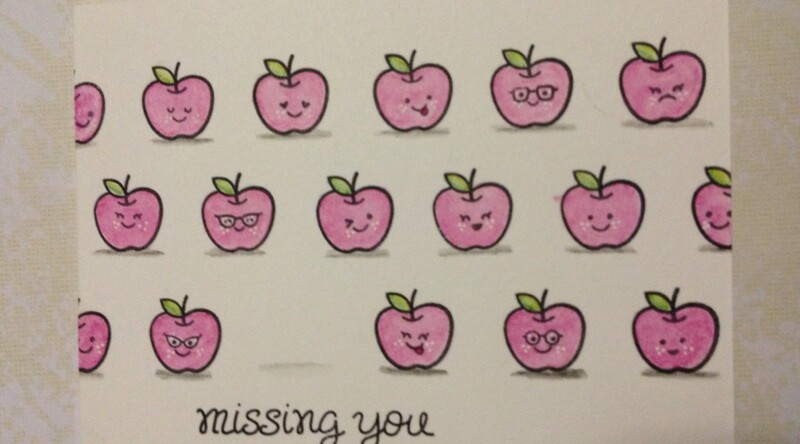 Card two: I only made three rows on this card and left one apple off to match the sentiment. Extra Details: I started with two card bases made form water color paper. 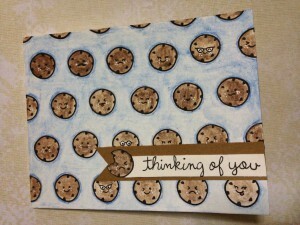 Using the grid mat and acrylic block with lines, I stamped the cookies and apples on each card base. I spaced each image about an inch apart. I used the faces form Thanks a Bushel and Sweet Smiles to give all the images some cute faces. I added sentiments next. 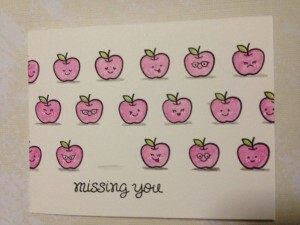 The apple card’s sentiment is right on the card base. The cookie card’s sentiment is on a banner with another cookie. I forgot to leave myself room for the sentiment and I had a smudge I wanted to cover up also. I felt that the sentiment and cookie banner did not stand out enough, so I added a kraft banner underneath. 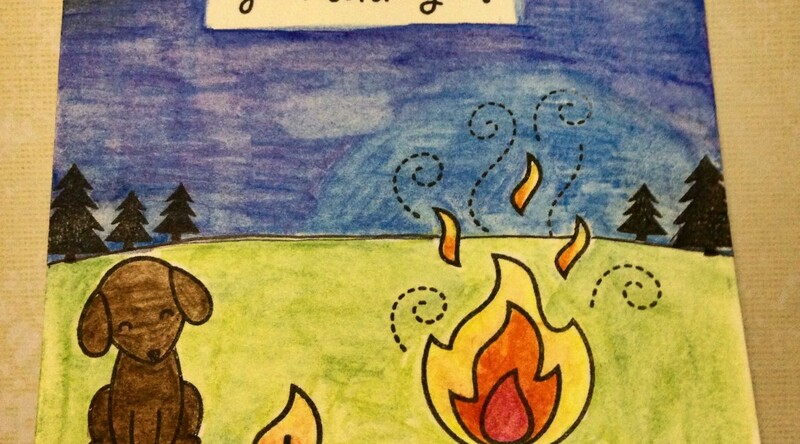 Lastly, I added color to my cards with water color pencils. I smoothed the coloring out with a water brush, and added some white gel pen dots on the cheeks. Once the cards were dry, they were ready to mail. Last weekend, my family and I were invited to a bonfire at a friend’s house. We had a great time roasting marshmallows and playing with their new dog. 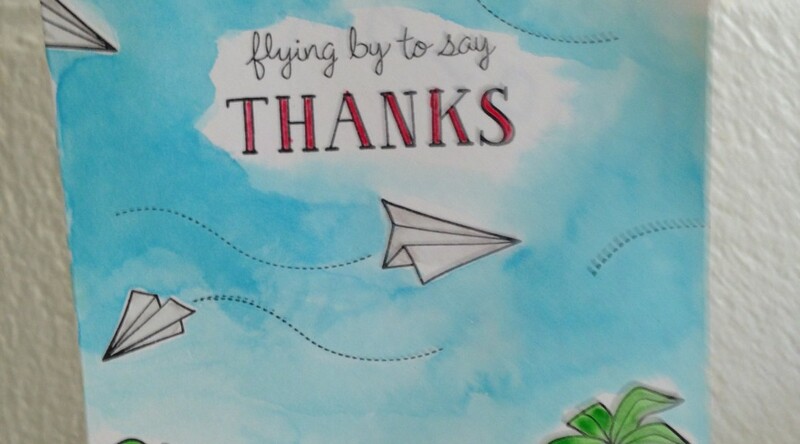 This is the thank you card that the kiddos and I created to thank our friends. Extra Details: I wanted to make a one layer card so I started by creating a card base from water color paper. Next I stamped the images on the card base. 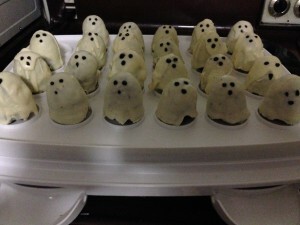 I only masked the single marshmallow on the stick. I wanted that marshmallow to be on fire and on the stick. We burned quite a few marshmallows that night. 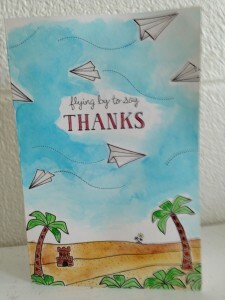 I added the sentiment on the top section of the card and used a thin black Sharpie to draw in the horizon line. I used some water color pencils to color the whole card. The kiddos helped me with the grass and sky. It worked out great. I was able to add water to smooth out the coloring. I kept the color away from the sentiment so that it would remain readable. Once the card was dry I was able to mail it. I was just having fun playing with my stamps today. 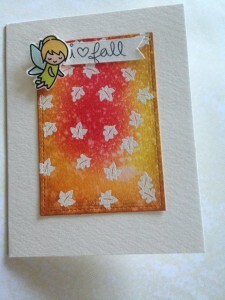 I made this card using some of the scene builder stamps from Lawn Fawn’s Happy Harvest. Extra Details: I started this card by die cutting a stitched rectangle from kraft card stock. 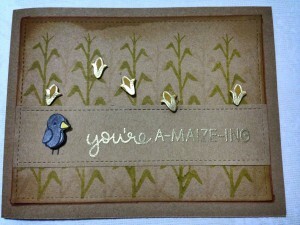 Next I stamped the corn stalks with Crushed Olive Distress Inks. I knew that I was going to add a strip for the sentiment, so I was able to stamp the bottom of the corn stalks again to make them taller. I added another layer of the corn stalks in Antique Linen Distress Inks. I added some Vintage Photo Distress to the edges of the panel. 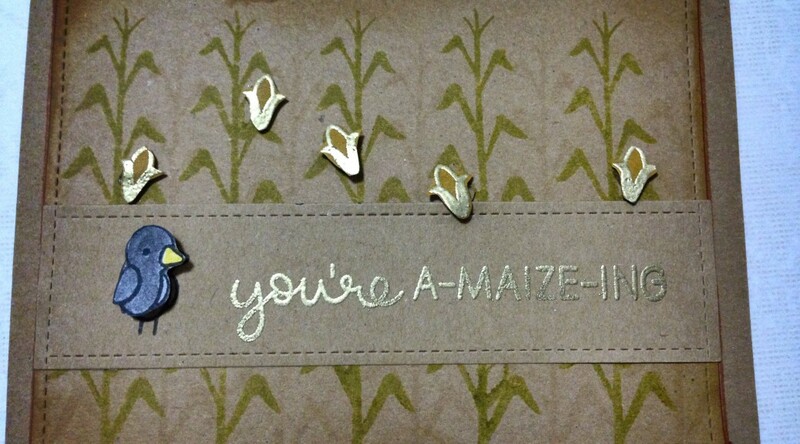 On a separate piece of kraft cardstock, I stamped the sentiment and some of the corn cobs. I heat embossed everything in gold. I added some Fossilized Amber Distress Ink on the corn cobs to give them some color. I fussy cut the corn cobs out and attached them to the stamped panel. I used my paper trimmer to trim my sentiment strip and popped that on the stamped panel with fun foam. I also added a crow form the same stamp set. I had already stamped and colored him on white card stock. Lastly, I adhered the stamped panel to a kraft card base and the card was done. 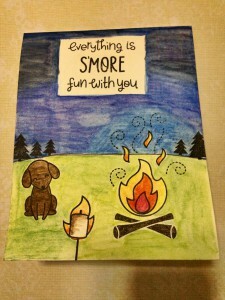 My daughter and I made this card last month for a birthday party she was invited to. I typed a blog post and them my computer ate it and refused to give it back. I have finally decided to try this blog post again. Extra Details: I started by covering a standard white card base in a piece of patterned paper. I also die cut a stitched rectangle from some water color paper. From the stitched rectangle, I partially die cut a stitched circle. To make the partial die cutting look finished, I added a stitched detail to the straight edge. Next up is the stamping. 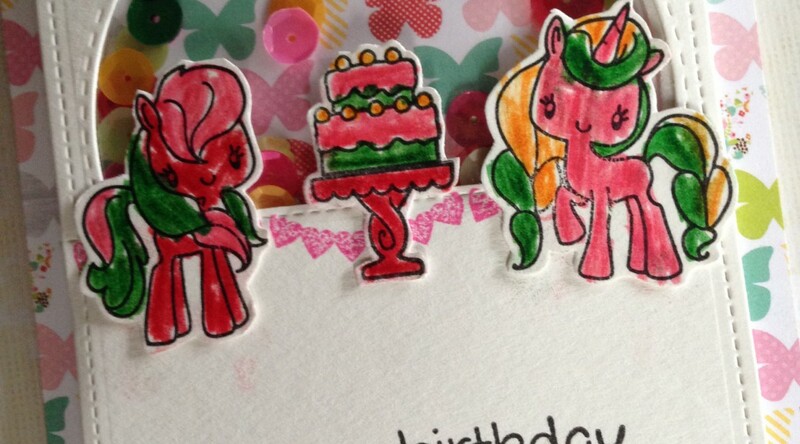 I stamped the ponies and cake on a separate piece of paper. My daughter colored the images in with her Crayola markers. On the stitched rectangle piece, I added some banners and the sentiment. I fussy cut the ponies and cake once my daughter was finished coloring. Now it is time to assemble the card. I added some clear plastic to the back of the semi-circle die cut. I added fun foam to the back of the same panel. My daughter added the sequins to the window and we adhered the card base to the stamped panel. 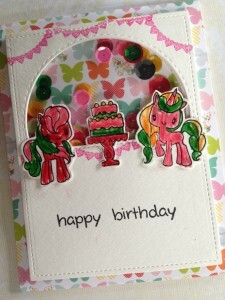 To finish the card, we attached the ponies and cake to the front of the card. My uncle celebrates his birthday this month as well. He works on a small farm with a lot of different kinds of animals. 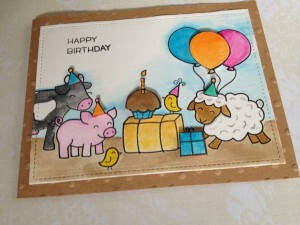 I thought it would be fitting if the barnyard animals were wishing him a happy birthday. Extra Details: I started by creating a kraft card base. I dry embossed some dots on the front of the card base. Then, I die cut a stitched rectangle panel form water color paper. I stamped the images on the panel. I masked the pig, so I could put the cow behind him. On a separate piece of water color paper, I stamped 1 balloon, 3 birthday hats, a present, and the cupcake. I used Distress Inks to water color these images. Once the ink was dry, I fussy cut out the balloon, cupcake, present, and hats. I attached those to the stamped panel with some DIY foam dots. I used a think black Sharpie marker to draw in the balloon strings. Lastly, I adhered the stamped panel to the kraft card base and the card was done. Yesterday, one of my student’s fathers came into my classroom to tell the students about United Arab Emirates. He was stationed there for 4 months with the United States Air Force. The presentation was very interesting. This is the Thank You card I created for my students to sign and send to him. I tried to create a card that reflected his presentation. Extra Details: I started with a full sheet of water color paper that I scored and folded in half to create a large card. Then, I started stamping. I drew the sand dunes in with a thin black Sharpie Marker. I also added some small dots to give the sand some texture. 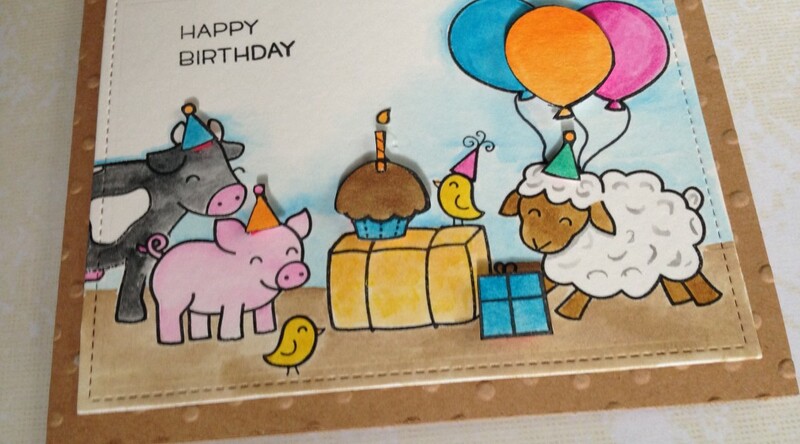 I used Crayola water colors to add color to the card front. I was a bit heavy handed with the brown paint on the tree trunks, but it dried in a really cool way. 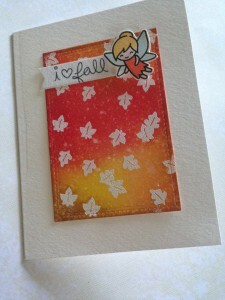 I have been loving all of the beautiful cards with fall colors I have been seeing lately. So I made two of my own. Extra Details: I started these cards by die cutting two stitched rectangles from water color paper. 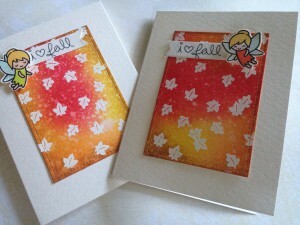 Using white embossing powder and Versa Mark ink, I added some leaves to each panel. Once the heat embossing was cool, I started adding color. I used Distress Inks in Candied Apple, Carved Pumpkin, Mustard Seed, Fossilized Amber and Vintage Photo. Using an ink blending tool, I just added areas of color, trying to blend the colors into one another a tiny bit. I found the two fairies in my box of images that I colored and cut previously. Using my paper trimmer I cut two small banners. I stamped the sentiment on each banner and added a fish tail with my scissors. I adhered the banner down flat to the stamped panel. The fairies are popped up on dimensional glue dots. Lastly, I added the stamped panels to some white card bases. I used water color paper for my card base because I love the texture it gives. Distress Inks in Candied Apple, Carved Pumpkin, Mustard Seed, Fossilized Amber and Vintage Photo. The fairies were also colored in Distress Inks but I don’t remember what I used.